Since the uprising began in March 2011, Syrian writers and artists have been creating work like never before, some becoming their own publishers on the internet and forming anonymous artists’ collectives. Culture has become a critical line of defence against tyranny. Syria Speaks is a celebration of a people determined to reclaim their dignity, freedom and self-expression. The line-up included award-winning Damascus-based novelist Khaled Khalifa, cinematographer and video artist Khalil Younes, writer and filmmaker Zaher Omareen and authors Malu Halasa & Robin Yassin Kassab. 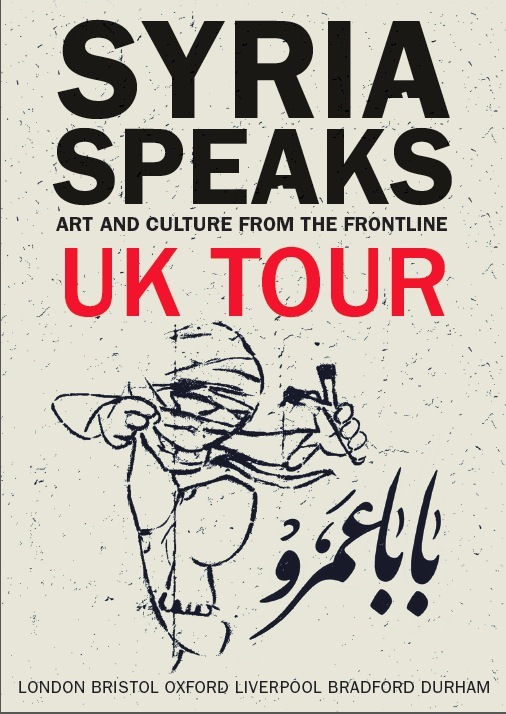 These events also marked the publication of Syria Speaks, a unique anthology of uprising literature, art and culture, showcasing the work of over fifty artists and writers who are challenging the culture of violence in Syria. Their literature, poems and songs, cartoons, political posters and photographs document and interpret the momentous changes that have shifted the frame of reality so drastically in Syria. Moving and inspiring, Syria Speaks is testament to the courage, creativity and imagination of the Syrian people. These events were presented by Reel Festivals/Highlight Arts in partnership with English PEN, Saqi Books, LIFT Festival, Prince Claus Fund, CKU, British Council and the Arab British Centre. This project is supported using public funding by the National Lottery through Arts Council England. The events took place in London (Rich Mix), Bristol (Foyles Bookshop), Oxford (Ashmolean Museum), Liverpool (Arab Arts Festival), Bradford (Fuse Arts Space) and Durham University. The visiting authors also took part in workshops with English PEN at schools, refugee community centres and a prison. You can buy the book from Saqi publishers: Syria Speaks: Art and Culture from the Frontline, edited by Malu Halasa, Zaher Omareen and Nawara Mahfoud.